I showed you this awesome polish before already, and when I was wearing Zoya Valerie and wanting something else after a day, I thought of this one. 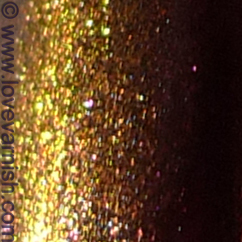 Nubar Moon Shadow is one of the legendary duochrome polishes Nubar released. It actually isn't a plain duochrome, but a multichrome. It is awesome, it really is! Nowadays you can find this one online listed as Moon Eclipse, but it is the same polish. In color at least, I don't own it so I don't know how it does formula wise. Moon Shadow is a tad tricky to apply, not because it drags or such, but it is sheer. Super sheer! By itself I'd need 4 coats for opacity, so when I though of this one while wearing Zoya Valerie, a match was quickly made. 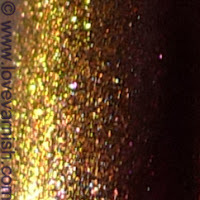 Now the Nubar does completely cover up the base in one coat because of the different type of finish, but the sparkle from Zoya Valerie did add an extra dimension to the manicure. I really loved this combo! You like it too? You captured the best of it, very very pretty! Damn look at that colour shift! Omg this is gorgeous!!! Glad you shared it again. I need more of Nubar's duochromes, I have Purple Beach and Indigo Illusion and their so pretty! This one looks awesome as well! Wow! The change of colour in this is amazing! Great swatching, I love this colour! It really is! And so so pretty! Right?! It is wicked. And even prettier in real life. Thanks Marisa <3 colors like these never bore. I should also check to see if I need more of the pretties!